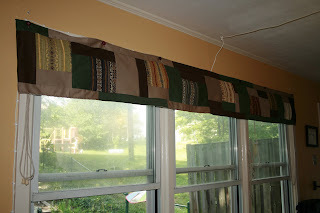 I recently made a patchwork valance for our living room. Loving how it turned out. I used scraps of fabric and upholstery fabric samples that I had on hand and mimicked the design of our area rug. 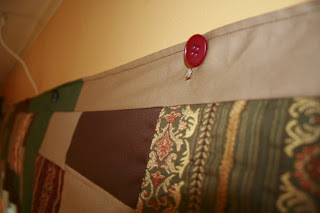 I put buttonholes along the top to attach it to the nails I hammered in along the window frame. I then hot glued buttons to the front of the nails. The entire thing was made from supplies I had on hand and basically cost nothing to make, other than my time. And it only took a day to finish it.